* SF-700 Magnetic Form Holder for Security Container Information Designed to house the SF-700 Form that contains vital information about the security container in which it is located. This information includes location, container number, lock serial number, and contact information if the container is found open and unattended. * SF-701 Magnetic Form Holder for Activity Security Checklist Designed to house the SF-701 Form, which is a checklist that is filled out at the end of each day to ensure that classified materials are secured properly and allows for employee accountability in the event that irregularities are discovered. * SF-702 Magnetic Form Holder for Security Container Check Sheet Designed to house the SF-702 Form that provides a record of the names and times that persons have opened, closed and checked a particular container that holds classified information. Closed(side) - White on Red Color. 6" x 2"
Replacement drawer head for a Diebold or Mosler Legal Size Class 5: Choice of Gray, Black or Parchment without lock. We require the year of manufacture of your container and serial # to ensure the correct drawer head. Optional inside delivery or lift gate services are available. Choice of Gray, Black or Parchment without lock. Brand new with 1 Yr. mfg. warranty; this is not a refurbished item. Follower Block for Class 6 and Class 5 file cabinet drawers. Brand new container with 1 Yr. mfg. warranty; this is not a refurbished item. Optional SF-702 and SF-700 Form holders available. GSA Approved Class 6 Special Size - 2 Drawer - Multi Lock - Parchment - Please specify either Kaba Mas X-10 Lock (replaces the older X-09 model) or S&G 2740 Lock, both of which are approved under FF-L-2740. GSA Approved Class 6 Map & Plan Cabinet - Size I - Black - Please specify either Kaba Mas X-10 Lock (replaces the older X-09 model) or S&G 2740 Lock, both of which are approved under FF-L-2740. GSA Approved Class 6 Map & Plan Cabinet - Size I - Parchment - Please specify either Kaba Mas X-10 Lock (replaces the older X-09 model) or S&G 2740 Lock, both of which are approved under FF-L-2740. GSA Approved Class 6 Legal File Cabinet - 4 Drawer - Multi Lock - Black - Please specify either Kaba Mas X-10 Lock (replaces the older X-09 model) or S&G 2740 Lock, both of which are approved under FF-L-2740. GSA Approved Class 6 Legal File Cabinet - 4 Drawer - Multi Lock - Gray - Please specify either Kaba Mas X-10 Lock (replaces the older X-09 model) or S&G 2740 Lock, both of which are approved under FF-L-2740. GSA Approved Class 6 Legal File Cabinet - 4 Drawer - Multi Lock - Parchment - Please specify either Kaba Mas X-10 Lock (replaces the older X-09 model) or S&G 2740 Lock, both of which are approved under FF-L-2740. GSA Approved Class 6 Letter File Cabinet - 4 Drawer - Multi Lock - Gray - Please specify either Kaba Mas X-10 Lock (replaces the older X-09 model) or S&G 2740 Lock, both of which are approved under FF-L-2740. GSA Approved Class 6 Letter File Cabinet - 4 Drawer - Multi Lock - Black - Please specify either Kaba Mas X-10 Lock (replaces the older X-09 model) or S&G 2740 Lock, both of which are approved under FF-L-2740. GSA Approved Class 6 Letter File Cabinet - 4 Drawer - Multi Lock - Parchment - Please specify either Kaba Mas X-10 Lock (replaces the older X-09 model) or S&G 2740 Lock, both of which are approved under FF-L-2740. GSA Approved Class 6 Legal File Cabinet - 5 Drawer - Single Lock - Gray - Includes Shipboard Mounting Base, tested and approved by GSA. X-10 Lock, approved under #FF-L-2740. GSA Approved Class 6 Letter Size File Cabinet - 5 Drawer - Single Lock - Gray - Includes Shipboard Mounting Base, tested and approved by GSA. X-10 Lock, approved under #FF-L-2740. GSA Approved Class 6 Letter Size File Cabinet - 5 Drawer - Multi Lock - Gray - Includes Shipboard Mounting Base, tested and approved by GSA. S&G 2740 Lock, approved under #FF-L-2740. GSA Approved Class 6 Letter Size File Cabinet - 5 Drawer - Single Lock - Gray - Includes Shipboard Mounting Base, tested and approved by GSA. S&G 2740 Lock, approved under #FF-L-2740. GSA Approved Class 6 Legal File Cabinet - 5 Drawer - Single Lock - Gray - Includes Shipboard Mounting Base, tested and approved by GSA. S&G 2740 Lock, approved under #FF-L-2740. GSA Approved Class 6 Letter Size File Cabinet - 5 Drawer - Multi Lock - Gray - Includes Shipboard Mounting Base, tested and approved by GSA. X-10 Lock, approved under #FF-L-2740. GSA Approved Class 6 Legal File Cabinet - 5 Drawer - Multi Lock - Gray - Includes Shipboard Mounting Base, tested and approved by GSA. X-10 Lock, approved under #FF-L-2740. GSA Approved Class 6 Legal File Cabinet - 5 Drawer - Multi Lock - Gray - Includes Shipboard Mounting Base, tested and approved by GSA. S&G 2740 Lock, approved under #FF-L-2740. GSA Approved Class 6 - Single Drawer - Single Lock - Gray - S&G 2937 Lock approved under FF-L-2937 - Approved for weapons storage and arms room key storage when also equipped with a KL-102 Key Locker. GSA Approved Class 6 - Single Drawer - Single Lock - Parchment - S&G 2937 Lock approved under FF-L-2937 - Approved for weapons storage and arms room key storage when also equipped with a KL-102 Key Locker. GSA Approved Class 6 - Single Drawer - Single Lock - Black - S&G 2937 Lock approved under FF-L-2937 - Approved for weapons storage and arms room key storage when also equipped with a KL-102 Key Locker. STEEL TRACKS: KX1125 has 3 strap assemblies consisting of straps, ratchets, strap anchors, and corner protectors. Two 36" long steel mounting angles and all necessary bolts are included. Mounting is accomplished by cutting the angles or tracks to the required length. The deck is drilled and the mounting hardware is then bolted securely to the deck. The angles or tracks can also be bolted directly into the Flex Deck anchoring system. In applications where penetrating the deck is impractical or prohibited, the angles or tracks may be welded in place. The KX1125 steel track version has been tested and qualified to MIL-S-901D Shock Test, Medium Weight and MIL-STD-167-1A Vibration for Shipboard, Hull-Mounted. ALUMINUM TRACKS: KX1130 has 3 strap assemblies consisting of straps, ratchets, strap anchors, and corner protectors. Two 36" long aluminum mounting angles and all necessary bolts are included. Mounting is accomplished by cutting the angles or tracks to the required length. The deck is drilled and the mounting hardware is then bolted securely to the deck. The angles or tracks can also be bolted directly into the Flex Deck anchoring system. In applications where penetrating the deck is impractical or prohibited, the angles or tracks may be welded in place. The KX1130 aluminum track version has been tested and qualified to MIL-S-901D Shock Test, Medium Weight and MIL-STD-167-1A Vibration for Shipboard, Hull-Mounted. Class 5 GSA Klsecurity 1526-B pricing Caster Base for Class 5 Container (2 drawer or 4 drawer) Black. Class 5 GSA Klsecurity 1526-G pricing Caster Base for Class 5 Container (2 drawer or 4 drawer) Gray. Caster Base for Class 5 Container (2 drawer or 4 drawer) Parchment. Set of 220V Replacement Fans for IPS Container. Single Door IPS - Shipping weight 710 lbs - Inside Dimensions: 18"H x 19 1/4"W x 27 1/4"D Outside Dimensions: 23 1/8"H x 22"W x 36"D - Includes Two 4" Cooling Fans, Cable Entry Box, and 19" Rack Mount. - Please specify either Kaba Mas X-10 or S&G 2740, both of which are approved under FF-L-2740. IPS Model 30-39-24. Unit can be equipped with either the 19" or 24" EIA vertical rack mounts. Please specify either Kaba Mas X-10 or S&G 2740, both of which are approved under FF-L-2740. Pull-Out State Department Rifle Cart; 28 1/2" Low Barrel Weapon Support w/ three (3) shelves. (cart holds 10 to 14 weapons, depending upon type). Pull-Out State Department Rifle Cart; 36 1/2" High Barrel Weapon Support w/ three (3) shelves. (cart holds 10 to 14 weapons, depending upon type). IPS Model 54-39-24. Unit can be equipped with either the 19" or 24" EIA vertical rack mounts. Please specify either Kaba Mas X-10 or S&G 2740, both of which are approved under FF-L-2740. IPS Model 54-45-24. Unit can be equipped with either the 19" or 24" EIA vertical rack mounts. Please specify either Kaba Mas X-10 or S&G 2740, both of which are approved under FF-L-2740. GSA Approved Class 5 Map & Plan Cabinet - Size I - Black - Please specify either Kaba Mas X-10 or S&G 2740, both of which are approved under FF-L-2740. GSA Approved Class 5 Legal File Cabinet - 2 Drawer - Gray - Please specify either Kaba Mas X10 or S&G 2740, both of which are approved under FF-L-2740. GSA Approved Class 5 Legal File Cabinet - 2 Drawer - Gray - Equipped with S&G 2937 Group 1 Lock, suitable for weapons storage only. GSA Approved Class 5 Legal File Cabinet - 2 Drawer - Multi Lock - Please specify either Kaba Mas X10 or S&G 2740, both of which are approved under FF-L-2740. GSA Approved Class 5 Legal File Cabinet - 2 Drawer - Multi Lock- Gray - Equipped with S&G 2937 Group 1 Lock, suitable for weapons storage only. GSA Approved Class 5 Legal File Cabinet - 4 Drawer - Single Lock - Gray - Please specify either Kaba Mas X10 or S&G 2740, both of which are approved under FF-L-2740. GSA Approved Class 5 Legal File Cabinet - 4 Drawer - Two Lock - Gray - Please specify either Kaba Mas X-10 (replaces the older X-09 model) or S&G 2740, both of which are approved under FF-L-2740. GSA Approved Class 5 Legal File Cabinet - 4 Drawer - Single Lock - Gray - Equipped with S&G 2937 Group 1 Lock, suitable for weapons storage only. GSA Approved Class 5 Legal File Cabinet - 4 Drawer - Multi Lock - Gray - Please specify either Kaba Mas X-10 or S&G 2740, both of which are approved under FF-L-2740. GSA Approved Class 5 Legal File Cabinet - 4 Drawer - Multi Lock- Gray - Equipped with S&G 2937 Group 1 Locks, suitable for weapons storage only. GSA Approved Class 5 General Purpose Cabinet, Size II - Please specify either Kaba Mas X-10 or S&G 2740, both of which are approved under FF-L-2740. Outside Dimensions: 43 1/2" H x 35 3/4" W x 26 3/4" D. Inside Dimensions: 40 3/4" H x 33 1/4" W x 23 1/4" D.
GSA Approved Class 5 Legal File Cabinet - 2 Drawer - Single Lock - Parchment - Please specify either Kaba Mas X-10 (replaces the older X-09 model) or S&G 2740, both of which are approved under FF-L-2740. GSA Approved Class 5 Legal File Cabinet - 2 Drawer - Multi Lock - Parchment - Please specify either Kaba Mas X-10 (replaces the older X-09 model) or S&G 2740, both of which are approved under FF-L-2740. GSA Approved Class 5 Legal File Cabinet - 4 Drawer - Single Lock - Black - Please specify either Kaba Mas X-10 (replaces the older X-09 model) or S&G 2740, both of which are approved under FF-L-2740. GSA Approved Class 5 Legal File Cabinet - 4 Drawer - Multi Lock - Black - Please specify either Kaba Mas X-10 (replaces the older X-09 model) or S&G 2740, both of which are approved under FF-L-2740. GSA Approved Class 5 Legal File Cabinet - 4 Drawer - Single Lock - Parchment - Please specify either Kaba Mas X-10 or S&G 2740, both of which are approved under FF-L-2740. GSA Approved Class 5 Legal File Cabinet - 4 Drawer - Two Lock - Parchment - Please specify either Kaba Mas X-10 (replaces the older X-09 model) or S&G 2740, both of which are approved under FF-L-2740. GSA Approved Class 5 Legal File Cabinet - 4 Drawer - Multi Lock - Parchment - Please specify either Kaba Mas X-10 or S&G 2740, both of which are approved under FF-L-2740. GSA Approved Class 5 Legal File Cabinet - 2 Drawer - Single Lock - Black - Please specify either Kaba Mas X-10 or S&G 2740, both of which are approved under FF-L-2740. GSA Approved Class 5 Legal File Cabinet - 2 Drawer - Black - Equipped with S&G 2937 Group 1 Lock, suitable for weapons storage only. GSA Approved Class 5 Legal File Cabinet - 2 Drawer - Multi Lock - Black - Please specify either Kaba Mas X-10 or S&G 2740, both of which are approved under FF-L-2740. GSA Approved Class 5 Map & Plan Cabinet - Size I - Parchment - Please specify either Kaba Mas X-10 or S&G 2740, both of which are approved under FF-L-2740. GSA Approved Class 5 General Purpose Cabinet, Size IV Black - Please specify either Kaba Mas X-10 or S&G 2740, both of which are approved under FF-L-2740. GSA Approved Class 5 General Purpose Cabinet, Size IV Parchment - Please specify either Kaba Mas X-10 or S&G 2740, both of which are approved under FF-L-2740. Class 5 GSA Approved Weapons Container with Group 1 S&G 2937 Lock. GSA Approved Class 5 Legal File Cabinet - 2 Drawer - Multi Lock Parchment - Includes Kaba Mas X-10 Lock approved under FF-L-2740. GSA Approved Class 5 Legal File Cabinet - 2 Drawer - Multi Lock Gray - Includes Kaba Mas X-10 Lock approved under FF-L-2740. GSA Approved Class 5 Legal File Cabinet - 2 Drawer - Multi Lock - Black -Kaba Mas X-10, both of which are approved under FF-L-2740. GSA Approved Class 5 Legal File Cabinet - 4 Drawer - Single Lock- Black - Equipped with S&G 2937 Group 1 Lock, suitable for weapons storage only. GSA Approved Class 5 Legal File Cabinet - 4 Drawer - Single Lock- Gray - Equipped with S&G 2937 Group 1 Lock, suitable for weapons storage only. GSA Approved Class 5 Legal File Cabinet - 4 Drawer - Single Lock- Parchment - Equipped with S&G 2937 Group 1 Lock, suitable for weapons storage only. GSA Approved Class 5 Legal File Cabinet - 2 Drawer - Single Lock- Gray - Equipped with S&G 2937 Group 1 Lock, suitable for weapons storage only. GSA Approved Class 5 Legal File Cabinet - 2 Drawer - Single Lock- Parchment - Equipped with S&G 2937 Group 1 Lock, suitable for weapons storage only. GSA Approved Class 5 Legal File Cabinet - 2 Drawer - Single Lock- Black - Equipped with S&G 2937 Group 1 Lock, suitable for weapons storage only. GSA Approved Class 5 Legal File Cabinet - 2 Drawer - Multi Lock- Parchment - Equipped with S&G 2937 Group 1 Lock, suitable for weapons storage only. GSA Approved Class 5 Legal File Cabinet - 2 Drawer - Multi Lock- Black - Equipped with S&G 2937 Group 1 Lock, suitable for weapons storage only. GSA Approved Class 5 Legal File Cabinet - 2 Drawer - Single Lock - Gray - Style 2 Lock, S&G 2740, approved under FF-L-2740. GSA Approved Class 5 Legal File Cabinet - 2 Drawer - Single Lock - Black - Style 2 Lock, S&G 2740, approved under FF-L-2740. GSA Approved Class 5 Legal File Cabinet - 4 Drawer - Multi Lock - Gray - Style 2 Lock, S&G 2740, approved under FF-L-2740. GSA Approved Class 5 Legal File Cabinet - 4 Drawer - Multi Lock- Black - Equipped with S&G 2937 Group 1 Lock, suitable for weapons storage only. GSA Approved Class 5 Legal File Cabinet - 4 Drawer - Multi Lock- Parchment - Equipped with S&G 2937 Group 1 Lock, suitable for weapons storage only. GSA Approved Class 5 Legal File Cabinet - 4 Drawer - Multi Lock- Gray - Equipped with S&G 2937 Group 1 Lock, suitable for weapons storage only. Custom rifle cart, low barrel, modified to support 20 M4 weapons. Pistol Insert for State Department Rifle Cart. Top Shelf Holds 20 Pistols. Lower Shelf holds 18 Pistols. Pistol insert for Class 5 Two and Four Drawer Containers. Can store 18 pistols per drawer. Holds Seven (7) low barrel & seven (7) high barrel weapons. Weapons Drawers for Class 5 Weapon Cabinets (Maximum 9 drawers per cabinet). Pistol Insert for weapons safe drawer; holds 40 Pistols per drawer. Standard Roll out rifle cart. Holds 32 weapons. Day Gate equipped with Electric Strike Kit and Self Latching Lock. Allows for hookup to alarm system and additional electronic entry components. Dock to Dock shipping included. Custom installation & setup available. 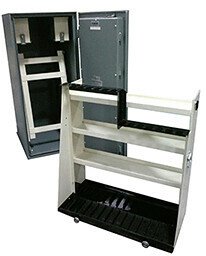 UL Listed TL-15 Rated Steel Safe - Meets DEA Regulations for the storage of all levels of controlled substances. Includes Heat Sensor and Door Contact for connection to an alarm system. Safe will be empty, no drawers included. UL Listed TL-15 Rated Composite Safe with Two Hour 350 Fire Rating - Meets DEA Regulations for the storage of all levels of controlled substances. UL Listed TL-30 Rated Composite Safe with Two Hour 350 Fire Rating - Meets DEA Regulations for the storage of all levels of controlled substances. Standard designed recessed door provides increased security versus a flat plate closure. The formed steel doors provide greater strength. Drip protection is standard. SKIDS – For ease of movement, the lead of each skid has a 45° bevel. LINING – Interior is finished with optional thicknesses (minimum of 3” to 4”) of hardwood lining with the first inner layer securely bolted in place; and the final build up is then covered with ½” plywood. The hinges are welded to the door and exterior of the magazine in compliance with the ATF directive. All hinges are greased and standard with zerk fittings. The hasps are protected with formed ¼” steel hoods that prevent sawing or lever action on the locks, hasps and staples per ATF construction guidelines. VENTILATION – The vent cover is a one piece laser cut of steel and then formed. On the interior, stand-off strips are placed over the liner to prevent the packing of explosives against the wall and obstructing ventilation. MOVEMENT / POSITIONING – To enable easy movement, each magazine has openings at the front and rear ends of the skids and lift rings are securely welded on the top for the attachment of chains or cables. LIGHTNING PROTECTION – A Grounding Kit is optional. LOCKS – BATF approved locks are available and can be keyed as required. GENERAL – All outdoor magazines are bullet-resistant, fire-resistant, theft-resistant and constructed to prevent direct contact with the ground. CAM LOCK CLOSURE - Steel rod with upper and lower latches provides a more secure closure when latched. Handle flip plate latch designed for an additional padlock. GROUNDING STRAP - attached between the door and housing to protect against electrostatic discharge. storage or to a truck bed for daytime use. regulations and / or guidelines.